Wheat grass blasted into popularity on the claim that it packs “23 servings of vegetables” into a single swig. While the sky high claim is almost certainly greatly exaggerated, it’s still praised by alternative health gurus. Folks don’t actually eat the wheat grass itself – it’s meant to be juiced then swallowed. I’ve had wheat grass juice a few times and it reminds me of green cough syrup, with a similar consistency and just as strong a smell. Wheat grass is exactly what it sounds like – the green shoots of the wheat plant. Since wheat at all stages of life is considered grass, a better term for the popular juicing wheat grass is wheat sprouts. Juice companies like Jamba Juice or Jugo Juice make a fortune charging 3 dollars for 5 cents of juiced wheat grass. That’s why many wheat grass addicts are growing their own wheat grass at home. Sprouts like wheat grass are the easiest to grow and quickest to mature of all edible plants. Of course wheat grass growers couldn’t be satisfied just selling to granolas! 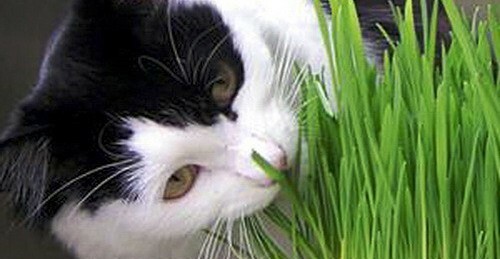 You can now buy wheat grass for your pets too! Ever heard of “cat grass”? It’s the same thing but marketed for cats instead of people. The idea is that if cats are eating your house plants, having “cat grass” around for them will encourage them to eat that instead. This is my favorite way to grow wheat grass – a five gallon wheat grass farm! It’s a grand 4 story system, making it a very space efficient way to grow wheat grass. The unit is specifically designed for growing sprouts, with a water reservoir and collection area to keep everything hydrated. Sprouts don’t actually need as much light as fully grown plants. Most of the energy they use for that first stage of growth is contained in their seed. They just need moisture and a bit of light so they know which way’s up. The five gallon wheat farm is from WheatGrassKits.com. 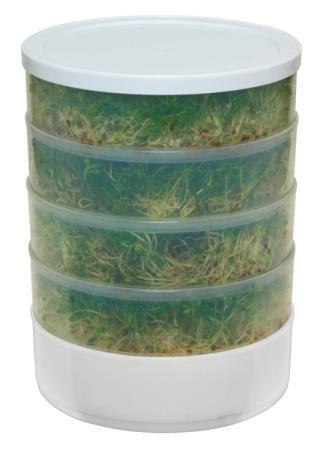 It’s designed for a ktichen countertop and will complete wheat grass for you from seed in as short as 2 days! I’ll confess that this wheat farm isn’t exactly 5 gallons – I’ve scribbled out a bit of pi-related algebra for you to find out that these units are 2.5 gallons. So you’ll need to combine two together to reach the most perfect volume. Want the best level headed analysis of wheat grass and its actual health effects? Let me usher you to Wikipedia.